Offered for sale with NO ONWARD CHAIN and now requiring some updating is this spacious 2 double bedroom, self contained, first floor apartment that has views towards the Sea from both bedrooms. This gas centrally heated and uPVC double glazed property still retains many character features with the 10` high ceiling accommodation comprising of Sitting Room, Kitchen, 2 Double Bedrooms and Bathroom. There is a single garage, communal gardens and a long lease. 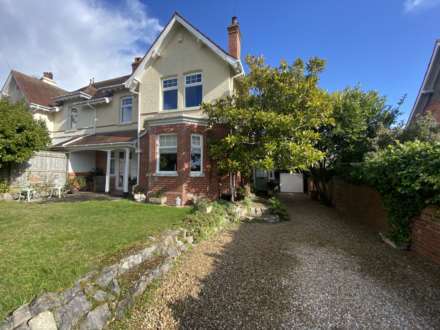 Situated in `The Avenues` and therefore within easy reach of Exmouth Town Centre and Beach, a viewing is advised. 3 Windows to front. Fitted, wall mounted gas fire, with back boiler that supplies the central heating and domestic hot water. 2 Radiators. TV point. Telephone point. Picture rail. Ornate coving. Window to rear. Range of cupboard and drawer storage units with roll edged work surfaces and tiled splash backs. Stainless steel single sink and drainer unit with mixer tap. Electric cooker point. The washing machine and fridge / freezer in situ are included in the sale. Radiator. Ornate coving. Dual aspect having window to front and window to side having Sea views. Radiator. Picture rail. Ornate coving. Walk - in bay window to side gaining Sea views. Radiator. Picture rail. Ornate coving. Obscure glazed window to rear. White panelled bath with mixer tap and shower attachment. Coloured suite of low level WC and pedestal wash hand basin. Tiled splash backs. Picture rail. Access to insulated loft space. The property is LEASEHOLD with 999 years and has a 1/6 share of the freehold. There are 6 apartments in St Trinians; each apartment pays a percentage of the maintenance determined by their floor space. Apartment 3 pays a 19.5% share. Currently there is no sinking fund and maintenance costs are shared on a pay as you go basis. The grounds are communal with 1/12 share being contributed towards costs. The garages are communal with 1/11 share being contributed towards costs. Apartment 3 St Trinians currently pays £81 per month to the block management company. This covers its share of the management fee, service charges, building insurance, gardening and a garage maintenance fund.